« Holidays’ Preparedness…Halloween, Thanksgiving and Christmas Oh My! I’ll admit that this was suppose to go out on Monday as my Monday Munchie BUT issues with a deadline of today kept me from getting it out. I know in reality it may never happen but I sure would love for things to clam…whoops….calm down just a bit. So I am a self-confessed foodie! I love to eat, I really LOVE to eat! New foodie experiences (with some reservations I will admit) are huge to me! As much as I love eating, I equally love cooking, inventing new recipes, pulling things out of the pantry and putting them together in some unique way. But a few months ago, I was diagnosed as allergic to garlic. Can you imagine a foodie allergic to GARLIC!!!! Talk about a kiss of death and insult to injury…its an EXTREMELY rare allergy. But it has inspired me to rethink how I cook, what I cook and what constitutes a seasoning and its need. And to start, I’m pulling out my old garlic free favs! 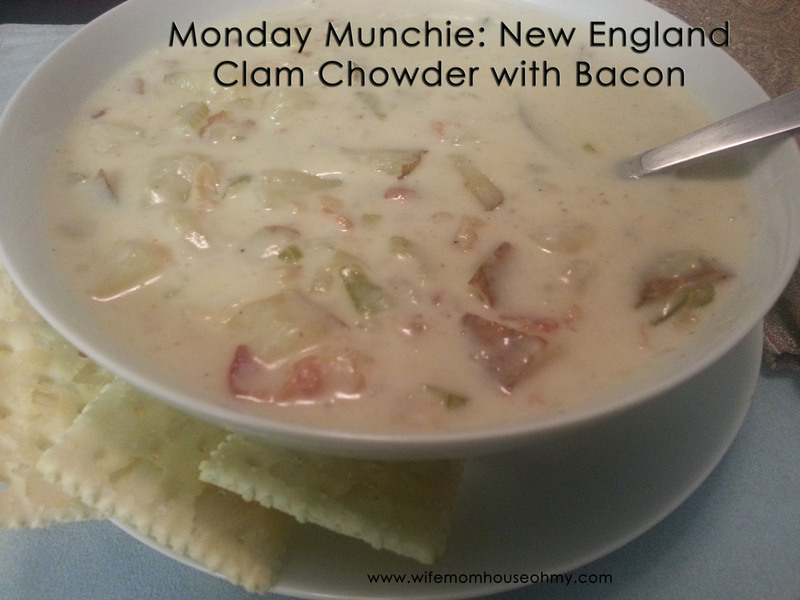 Hence, New England Clam Chowder. I don’t know about you but I adore clam chowder with BACON. (Kind of feel like the beggin dog treat food commercial with the dog yelling “Bacon! Gotta have bacon!”) It adds such a earthy, warm, nostalgic feeling to almost any soup. My mom’s traditional clam chowder tends to be a little on the liquidy side. Its good but I prefer my soup to have a balance between runny and paste. It needs some stick to the bones goodness to it but also still be on the side of soup too. Here is a recipe I love (even better since no garlic). It serves five hearty bowls worth and total time is about 45 minutes. Even my semi-picky teenager handed in a clean and empty bowl! Prep all ingredients first. Set aside in small bowls or plates. In larger stock pot, add bacon and cook until slightly crisp over medium-high heat. Leave bacon fat in pot with diced bacon. Add diced onions and diced celery into pot with bacon. Cook under slightly transparent – approximately 5 to 7 minutes. Stir frequently to prevent burning. Add diced potatoes and enough water to completely cover potatoes. Add salt and pepper. Stir all ingredients until well combined. Bring to a full boil and cook uncovered until potatoes are fork tender (slip right off when potato stuck by fork). This takes about 15 minutes over medium high heat. Pour in whipping cream, minced clams and juice, and add butter. Stir. In a measuring cup, add two tablespoons of cornstarch. (This is a cheat. Traditional method for making thicker chowder is with a rue.) Add about 8 to 10 spoonfuls of liquid from the chowder to the cornstarch and mix well so there are not lumps. Slowly add to the chowder, constantly stirring. Continue stirring for about five minutes or until heated through. Chowder will thicken moderately as you stir. Ladle in two bowl, add crackers, serve and ENJOY!